(Newport, Oregon) – As spring break begins in the northwest, the central Oregon coast town of Newport offers a unique array of features for those getting away from it all. Two lighthouses, various family events, a massive working bayfront full of docks, fishing boats and manmade attractions, and more high vantage points for spotting whales than anywhere else on the coast are some of the pleasantries awaiting. Spring Whale Watch Week. From March 20 to 27, volunteers will be out in full force to help you spot whales meandering past. They will be at 26 high vantage points along the Oregon coast – but seven of those are in the Newport area. Just north of Newport, in the Depoe Bay area, there are Boiler Bay State Scenic Viewpoint, Whale Watching Center at the Depoe Bay Sea Wall and Rocky Creek State Scenic Viewpoint. Just outside of Newport are Cape Foulweather and the Devil's Punchbowl State Natural Area. Within Newport are Yaquina Head Outstanding Natural Area and Don Davis City Park in Nye Beach. Crabbing and Fishing: Crabbing is exceptionally easy along Newport’s Yaquina Bay, with various docks on both sides providing plenty of spots to drop the crab pots. The bay hosts a number of deep sea fishing and crabbing cruises, as well as whale tours. You do need a state license. Two Lighthouses. The tallest one on the coast sits at Yaquina Head, and its interpretive center is open 10 a.m. - 4 p.m. Touring the lighthouse happens noon to 4 p.m., seven days a week. There is a $3 entrance fee to the park. 541-574-3100. 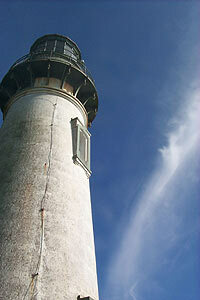 The lighthouse at Yaquina Bay is also open for self-guided tours, noon to 4 p.m., seven days a week. It is free, but donations are encouraged. 541-265-5679. Fun for Kids. Sandy beaches abound along Nye Beach up to Agate Beach, next to Yaquina Head (which is also a surfers’ magnet), as well as at South Beach State, on the southern side of the bay. For more information, see www.discovernewport.com.